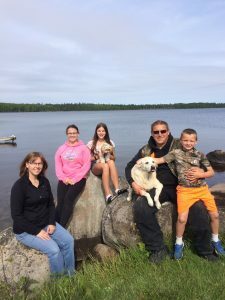 Michael, Tina, Chelsea, Kyrsten, Owen and our dog Cinder and Pebbles, welcome you to Procyk’s Anglers Paradise Lodge, formerly known as McEwen’s Northern Shores! As a family-owned and operated fishing lodge in Northwestern Ontario, Canada we pride ourselves on the level of service and friendly atmosphere we’ve created for our guests. Experience the difference that we can offer with personalized service, excellent equipment, modern facilities and the kind of hospitality that comes right from our Canadian roots. Join us for a memorable vacation in this Northern Ontario wilderness. You’ll be glad you did and it is our hope that you’ll truly have something to look forward to when you return to see us year after year. Read some of our customer testimonials and see why our guests come back year after year.